Need a hedge? Hawthorn or Blackthorn? I say BOTH! This old English proverb is simply advising us not to switch to our summer wardrobe too early in the year – and to wait until the Hawthorn (May tree) is flowering. Advice worth heeding for gardeners too I believe, when deciding when to plant out tender plants and considering when all risk of frost has passed. Nature has an uncanny way of knowing these things. 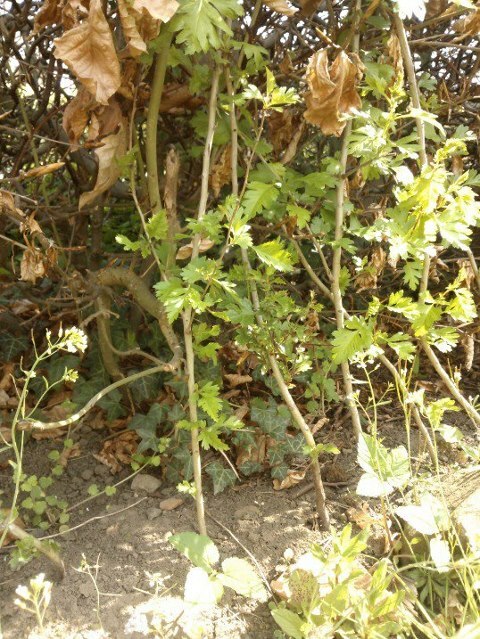 So, you’re thinking of planting a hedge and you want it not only for yourself but also for future generations to enjoy; something that is pretty as well as functional that will be around for a very long time; something that the birds and bees will thank you for… Then a Hawthorn and Blackthorn mix has to be one to consider. In England, particularly at this time of year you can’t but notice the Hawthorn. The name ‘Haw’ derives from ‘hage’ which is Old English for ‘hedge’. The tree which flowers in mid to late spring is traditionally known as the May Tree, the blossom itself being called May. 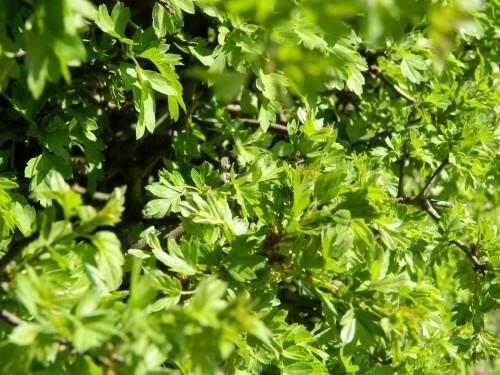 One reason why it’s so widespread is because Hawthorn hedging was planted across England in the Parliamentary Enclosure period, between 1750 and 1850. It remains to this day extremely common in the countryside, some maintained by farmers but others left to grow to full size. The tangle of branches are ideal for birds to build their nests, the flowers vital nectar for bees and its fruit (called haws) an important food source for all sorts of wildlife through the winter months. Blackthorn is another type of tree ideal for hedging that is widespread across the English countryside. Its long thorns have made it popular with farmers for centuries as the perfect barrier for keeping their livestock contained. 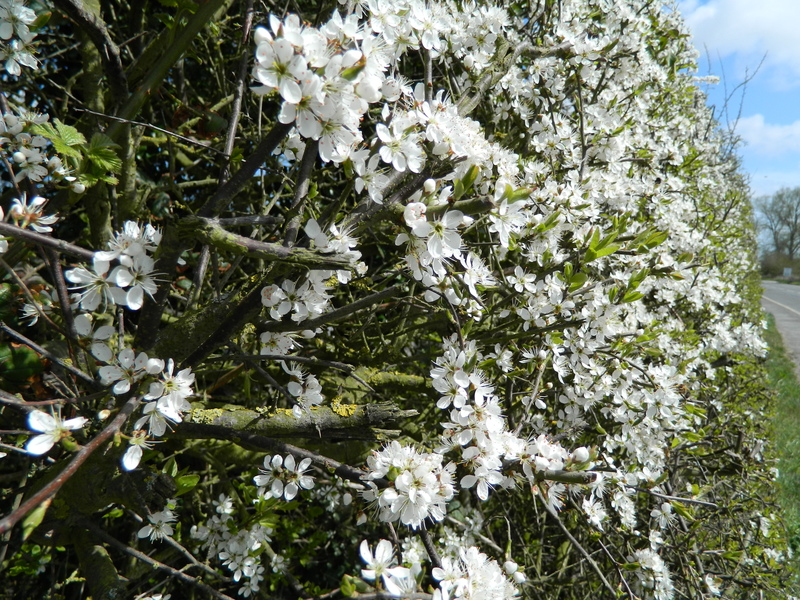 Again, a huge attraction to birds and bees, the Blackthorn hedge produces beautiful white flowers in the early spring, followed by Sloe berries that ripen in October. 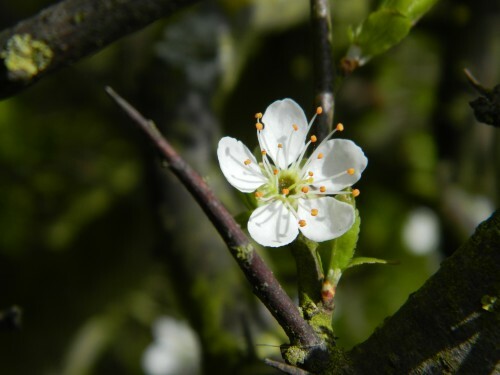 A native species, the Blackthorn hedge plant has profuse white flowers on bare black stems in April, followed by small, dark green leaves on the spiny stems and blue sloes in autumn. Blackthorn and Hawthorn make good bedfellows and they are often used in tandem to create a mixed hedge. Blackthorn blossoms in early spring (on bare branches, before the leaves appear) and Hawthorn flowers slightly later on (after leafing), so between them they offer an extended and impressive flowering period. In addition, both can be propagated from cuttings, making a low cost and wildlife-friendly hedging option. Cut several four to six inch softwood stems from a healthy Hawthorn or Blackthorn tree. Softwood stems are young stems that are tender but mature enough to break with a cracking sound when bent. Use a sharp, clean knife to make each cut just below a node. Strip the leaves from the lower half of the cuttings and dip the bottom inch into a rooting hormone. Fill a pot with some gritty cutting compost and moisten but not saturate. Poke planting holes into the compost and insert the cuttings. You can plant several in the same container as long as the leaves don’t touch. Cover the container with a clear plastic bag. Seal the bag tightly around the pot with a rubber band. The bag keeps the cuttings moist and warm. Check the cuttings for roots after two to three months. Remove a cutting from the potting mixture with a table knife or spoon and replant if the roots aren’t at least half an inch long. When they’re ready (the roots are one to two inches long), re-pot the cuttings into individual three to four inch containers filled with a general purpose potting mixture. Again cover each container with a plastic bag but this time poke several holes in the bags. Leave the covers on the pots for about a week, as this gives the cuttings time to gradually adjust to the cooler, drier air. Move the young trees outdoors in spring, placing them in a protected location away from extreme temperatures and bright sunlight (see picture). Mulch the trees with straw during the winter and move them to their permanent home after two growing seasons. Finally, both Hawthorn and Blackthorn are quite slow growing but the end result is worth the wait and your hedge will be around for up to a hundred years! Go on – hedge your bets, I reckon you’ll be glad you did. what time of the year should you strip the berry?I have picked berries and i do not know when to put them in plastic bags. thank you caroline. Thanks for your comment, Caroline. We didn’t use berries (although you can if you prefer) but instead took cuttings in autumn from semi-ripe wood. The cuttings themselves were around six to eight inches long. Tear off any leaves and side shoots leaving just a couple at the top, then bury most of the stem below the surface of your growing medium – the more leaf nodes buried the more chance it will root from one of them. Shoots torn off the mother plant leaving a heel is another way of doing it – see our post about propagating lavender for how. Leave the pot containing all your cuttings in semi shade – at the side of an east facing wall is good, water occasionally in summer or during a dry spell so it never completely dries out and by the following autumn tip the pot upside down and transplant the ones with roots into separate pots to grow on. We are going to put up a wall lean-to greenhouse against a north/east wall of our stables, which gets morning sun only. I particularly want a place for cuttings and propogation generally, that will act as a cold-frame does, only taller – because our polytunnel gets too hot for this long-term softwood propogation. If I did this, would you still need to put polythene bag over top of cuttings in the pot? if you have a lot, its quite irritating to keep opening the polythene to moisten. Secondly, I agree with one of your responders who notes that many hawthorn babies seem to pop up in the grass alongside an existing mature hedge. How have these naturally propogated plants happened? Must surely be from natural seed drop? And if I wanted to dig some of these up from the grass and transplant them back into the thinner areas of the hedge, or begin a new hedge with them, how and when is the best time to do these. I don’t want to kill them as they are so lovely and green and lush. Actually my husband accidentally mowed some over a while ago, and I notice they have come back just as good. Hi Ron – I can’t see why not. Hawthorn and blackthorn are very hardy and will tolerate your climate with ease. Your local honey bees will be very grateful ….AND you can reward yourself with some homemade sloe gin to cheer up those cold wintry days! Both Hawthorn and Blackthorn are excellent for wildlife, gray partridge for example. We have Blackthorn along field edges in west Romania, but not enough. I tried for years to propagate it and did not succed. The problem is I want to have it as kilometers long hadges, planting cuttings is not an option. Unfortunately I do not know how to propagate from seed, but interestingly it starts by itself in new places, how this hapens I don’t know. I think the blackthorn starting on it’s own are actually suckers sprouting from the main root. It’s been said that sometimes these suckers can travel underground for quite a distance before popping up. can hawthorne be started from hardwood cuttings taken now (march)? What about using seeds that have overwintered on the tree? 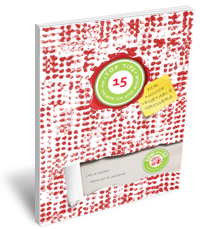 we are developing a “creative sustainability” project on our 2 acre property here in nova scotia – zone 5b. first steps are planting more trees and large shrubs (100 so far), and building an underground greenhouse this summer. also – beginning a sculpture park in large field. we want to plant hawthorns in hedgerow. reading Diana Beresford-krugher’s book on trees – excellent. she recommends hawthorne plantings. Hello there! What a fantastic project – such foresight. The local wildlife is going to be so grateful and your legacy will outlive all of us. Just make sure you use new wood which pops and snaps when bent …and dip the cut surface in rooting powder or gel WHICH IS LESS THAN A COUPLE OF WEEKS OLD because rooting hormone products have an incredibly short shelf life – something that the manufacturers don’t tell you about! Another tree you might also be interested to hear about is the Marabella (or Mirabelle) Plum which blossoms at the beginning of March so it’s great for early foraging bees. It can be seen now in a lot of hedgerows in East Anglia (where I live), smothered in flowers shining white like a beacon alongside Hawthorne and Blackthorn, which don’t flower until April and May. Bridget recently posted…X for Xenogamy – Word up! Sorry, I forgot to talk about using over wintered berries – I really don’t know as I’ve not propagated Hawthorne this way. I wonder whether the berries need to have been through a cold spell to prompt germination? Have you had a good cold winter with some hard frosts? I have purchased 6 Hawthorns in pots. They are 4-5ft high. I wish to plant them as a small hedge which I will maintain at this height. However, when planting, can I maximise the width of the hedge by planting at a 45 degree angle in the trench or do they need to be upright? once planted, do I need to trim at all? The planting site is for a quick privacy screen on a breezy site in rural Staffordshire, UK. My only experience of this kind of propationare willow sticks which are fine for three or four days max then a good soak in water before pushing into the ground. However, willow IS of course uber easy to strike… Something like rosa rugosa also makes an excellent and impenetrable barrier – a bit of a thug but as tough as old boots and a wildlife magnet with its sweet scented flowers and big red hips. An iron fist in a velvet glove! Good luck. Will Blackthorn and/or Hawthorne survive mid-Michigan winters in the U.S.? (below the 45th Parallel). Temperatures can hover around 0 degrees centigrade for days. We were recently in Ireland & Scotland, and I have fallen in love with these hedges! I reckon they’d be fine in your Michigan climate which doesn’t sound dis-similar to our own. They are rather slow growers but well worth the wait, much loved by wildlife and very long lived. I wish you well! Different methods of pruning hedges depending on the plant species could be used. For recently planted hedges few species such as blackthorn, hawthorn and privet can be decreased to around 10cm rapidly after planting. This serves to ensure that they will grow from low down and make dense formal hedges. Most of the deciduous plants are best diminished by around a third in the autumn after seeding. Hi Deborah, I would say about 50 cm between the plants is sufficient. Good luck with planting. I will be making Hawthorn ketchup soon, if it tastes good I will post the recipe! I have 2 red hawthorne’s that seeded themselves, probably from birds, I have 1- 42 year old blooming red hawthorne. I am not sure I understand your question. If they are old have they never bloomed before? Usually our hawthornes bloom in May so I take it that yours should bloom around the same time. I hope this helps. If not please let me know. the 2 younger ones have not bloomed yet, they are only about 40′ from the one that blooms. Just give it another year, mine are now 3 years old and in full bloom. They need to establish first.